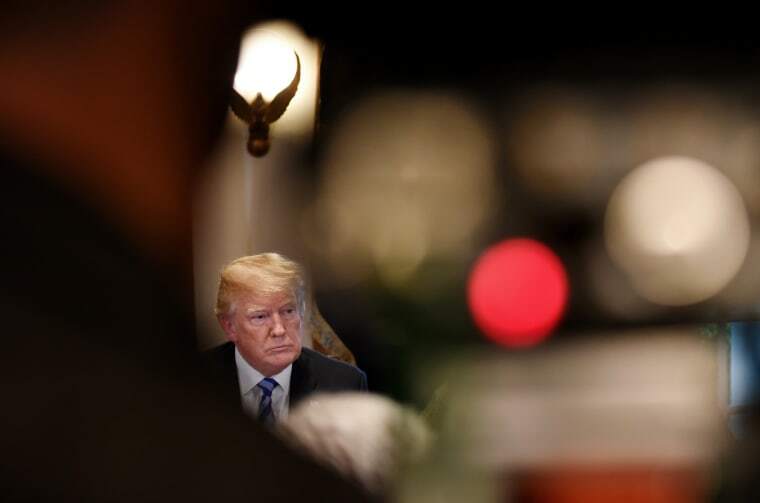 WASHINGTON — President Donald Trump's allegation that the Department of Justice put a "spy" inside his presidential campaign to frame him is being widely dismissed as absurd by current and former law enforcement officials. "The notion of fully embedded government operatives inside a campaign is hard to imagine under these circumstances," said Frank Figliuzzi, a former head of FBI counterintelligence and an NBC News national security analyst. "What is easier to imagine is the FBI trying to flesh out information on Russian intelligence operatives by making approaches to campaign staffers if the reasonable suspicion was there and the approvals were in place." The goal, Figliuzzi said, "would be to try to determine the degree to which Russian intelligence services were targeting the campaign, and whether any campaign officials were receptive to that targeting." Both The New York Times and The Washington Post have reported that the FBI made use of one or more informants in its Russia investigation. The Times says one person working with the FBI met with two Trump aides who were suspected of dealing with Russians: Carter Page, who was under FBI surveillance, and George Papadopoulos, who pleaded guilty to lying to the FBI and is cooperating with special counsel Robert Mueller's investigation. NBC News has not confirmed the use of informants in the Russian interference investigation, which began in July 2016. A right-wing web site, the Daily Caller, first reported that both Page and Papadopoulos met during the campaign with an American professor at Cambridge University in England. One of the men, Papadopoulos, has told associates he now views his encounter with the professor with suspicion, two sources familiar with his story told NBC News. Papadopoulos is the aide who, according to his plea agreement, was told by an apparent Russian agent that the Russians had access to thousands of hacked Hillary Clinton emails — before the fact that Democratic emails had been hacked had been made public. Papadopoulos was arrested in July 2017, and has pleaded guilty to lying to the FBI. He did not respond to requests for comment. No evidence has surfaced publicly indicating that Halper was acting as a government informant. He did not respond to an NBC News request for comment. But the Daily Caller noted that right-wing media personalities have speculated about his role in recent days. Two sources familiar with Papadopoulos's account told NBC News he has described being summoned to England in September 2016 by Halper, who was offering to pay him to discuss energy issues involving Turkey, Israel and Cyprus, which was his area of expertise. Papadopoulos told associates that Halper attended the meetings with his assistant, a young Turkish woman. Papadopoulos said he found Halper's demeanor odd, and in retrospect believes Halper was working on behalf of an intelligence or law enforcement agency, the sources said. In an email to NBC News, Page said he didn't find his encounters with Halper concerning. Page told the Daily Caller he met several times with Halper, including on Halper's farm in Virginia. Halper's father-in-law, Ray Cline, was the chief CIA analyst during the Cuban missile crisis. "At the time, I never found his actions suspicious," Page told NBC News. "He never offered me one cent. Just 2 foreign policy scholars having some discussions. That's about all that I took it as." Papadopoulos also told associates he was approached over LinkedIn in July 2016 by Sergei Millian, a Belorussian-American businessman who has claimed business ties to Trump, and who also has been named by The Wall Street Journal and The Washington Post as a source for the notorious Christopher Steele dossier. After Trump won the election, Papadopoulos said, Millian called him and said he assumed Papadopoulos would be working in the White House. Millian wanted to pay Papadopoulos as a consultant at the same time, according to Papadopoulos, hunting for business opportunities for wealthy Russian clients. Papadopoulos told associates he felt such a relationship would have been illegal, and turned it down. Millian could not be reached for comment. Several months later, Papadopoulos was arrested. He has pleaded guilty to lying to the FBI during a Jan. 27, 2017 interview.